Jet black daily disposable eye enlarging contact lenses. The base of this type of contact lenses is DAILIES All Day Comfort. Produced in the LightStream technology, they provide the same parameters, thin, subtle edges and high usage comfort. Furthermore, the use of AquaComfort system provides an excellent hydration. There is a black ring on the lens, created to enlarge and enhance the eye. It’s made with the use of a dual-layer printing technology to match the natural brown and black shades of the eyes. 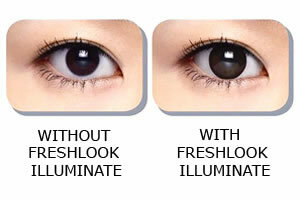 Freshlook Illuminate Jet Black contact lenses are made especially for people with dark irises. If you have naturally light eyes, you should try enlarging them with Freshlook Illuminate Rich Brown contact lenses as they won't stand out so much. Plano contact lenses are in stock and now available, while waiting time for the remaining powers is about 1 week.